In this section we provide a summary of resources and tools used in the Weeds and Climate Change technical guide. To find out more about definitions and terms used, click on the topics below. For more information about data available on CSIRO’s Data Access Portal, examples, case studies, references and other tools available, choose from the menu on the right hand side. Weed: A plant not wanted where it is found. An entirely subjective determination based on value systems within a human context. Weeds usually have detectable economic or environmental effects and are often both alien and invasive, but this is not always the case (Richardson et al. 2000). Alien (exotic, non-native): A plant occurring outside its natural past or present range and dispersal potential in the timeframe under consideration, its presence being due to human actions (either deliberate or accidental) (Pyšek et al. 2004, Richardson et al. 2011, Webber and Scott 2012). Naturalised (established): Self-sustaining plant population over multiple generations without human assistance or intervention (Richardson et al. 2000, Pyšek et al. 2004). Invasive: A subset of naturalised plants that are undergoing or have the potential for rapid range expansion (i.e. change in extent over time) (Richardson et al. 2000, Wilson et al. 2014). Range expansion rates can be clearly quantified (Wilson et al. 2014), but what is deemed rapid or not remains a subjective decision (perhaps influenced by what is normal for the plant in question in its native range or what might be average range change in the recipient community). No implication of impact or a requirement for change in abundance is associated with this term (Valéry et al. 2008, Wilson et al. 2014). May or may not be a weed or alien. Sleeper weeds (alert weeds): A subset of plants that have naturalised in a region, but have not yet increased their range and/or abundance exponentially. Evidence (or risk assessment) indicates, however, that they may become invasive or have impact in the future (Groves 1999). Transformers: A subset of invasive plants that have impact to the extent that they change the character, condition, form or nature of ecosystems over a substantial area relative to the extent of that ecosystem (Richardson et al. 2000). Impact: A measurable change in the region of introduction that can be attributed, either directly or indirectly, to the addition of an alien species. The assessment of impact can be based on one or more measures and the same measure may be viewed subjectively as positive or negative by different managers. Can be assessed using the Australian Weed Risk Assessment protocol (Parker et al. 1999, Wilson et al. 2014). Eradication: The removal of all individuals from an area into which migration cannot be allowed to occur (Myer et al. 1998). Containment: Deliberate action taken to prevent range expansion within a predefined area (Clarkson and Grice 2013, Grice et al. 2012, 2013). Control: The use of chemicals and other means to cause a reduction in density of a plant population. Classical Biological Control: Introduction of host specific organisms (usually arthropods or fungi) for the control of invasive plants. It is called “classical” because it has been practiced for over 100 years. Other forms of biological control include augmentation (e.g. bioherbicides) and conservation approaches (McFadyen 1998). Clarkson, J.R. and Grice, A.C. (2013) Managing plant invasions: strategic options defined. In: O’Brien, M., Vitelli, J. and Thorby, D. (eds) Proceedings of the 12th Queensland Weeds Symposium. 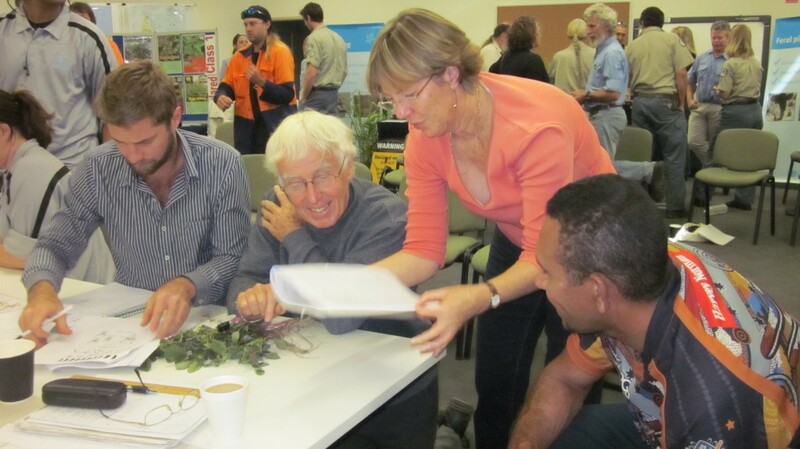 Queensland Weeds Society, Hervey Bay. pp 35-38. Grice, A.C., Clarkson, J.R., Friedel, M.H., Murphy, H.T., Fletcher, C.S. and Westcott, D.A. (2012) Containment: the state of play. In: Eldershaw, V. (ed.) Proceedings of the 18th Australasian Weeds Conference. Victorian Weed Society, pp. 320-324. Grice, A.C., Clarkson, J.R., Murphy, H.T., Fletcher, C.S. and Westcott, D.A. (2013) Containment as a strategic option for managing plant invasion. Plant Protection Quarterly 28, 64-67. Groves, R. (1999) Sleeper weeds. In: Bishop, A.C., Boersma, M. and Barnes, C.D. (eds) Proceedings of the 12th Australian Weeds Conference. Tasmanian Weed Society, Devonport, Tasmania, pp. 632-636. McFadyen, R.E.C. (1998) Biological control of weeds. Annual Review of Entomology 43, 369-393. Myer, J.H., Savoie, A. and van Randen, E. (1998) Eradication and pest management. Annual Review of Entomology 43, 471-491. Parker, I.M., Simberloff, D., Lonsdale, W.M., Goodell, K., Wonham, M., Kareiva, P.M., Williamson, M.H., Von Holle, B.V., Moyle, P.B., Byers, J.E. and Goldwasser, L. (1999) Impact: toward a framework for understanding the ecological effects of invaders. Biological Invasions 1, 3-19. Pyšek, P., Richardson, D.M., Rejmánek, M., Webster, G.L., Williamson, M. and Kirschner, J. (2004) Alien plants in checklists and floras: towards better communication between taxonomists and ecologists. Taxon 53, 131-143. Richardson, D.M., Pyšek, P., Rejmánek, M., Barbour, M.G., Panetta, F.D. and West, C.J. (2000) Naturalization and invasion of alien plants: concepts and definitions. Diversity and Distributions 6, 93-107. Richardson, D.M., Pyšek, P. and Carlton, J.T. (2011) A compendium of essential concepts and terminology in invasion ecology. In: Richardson, D.M. (ed.) Fifty years of invasion ecology: the legacy of Charles Elton. Blackwell Publishing Ltd, Chichester, pp. 409-420. Trudgen, M.S., Webber, B.L. and Scott, J.K. (2012) Human-mediated introduction of Livistona palms into central Australia: conservation and management implications. Proceedings of the Royal Society B: Biological Sciences 279, 4115-4117. Valéry, L., Fritz, H., Lefeuvre, J.-C. & Simberloff, D. (2008) In search of a real definition of the biological invasion phenomenon itself. Biological Invasions, 10, 1345–1351. Webber, B.L. and Scott, J.K. (2012) Rapid global change: implications for defining natives and aliens. Global Ecology and Biogeography 21, 305-311. Wilson, J.R.U., Caplat, P., Dickie, I.A., Hui, C., Maxwell, B.D., Nuñez, M.A., Pauchard, A., Rejmánek, M., Richardson, D.M., Robertson, M.P., Spear, D., Webber, B.L., van Wilgen, B.W. and Zenni, R.D. (2014) A standardized set of metrics to assess and monitor tree invasions. Biological Invasions 16, 535-551.